A Service Dog is a dog that is individually trained to preform tasks to mitigate a persons disability. Service Dogs: for people with disabilities other than those related to vision or hearing including but not limited to Post Traumatic Stress Disorder, Seizures, Blood Sugar, Bipolar, Autism, Mobility, Depression, Anxiety and over 300 other disabilities. Although Guide Dogs for the blind have been trained formally for over seventy years, training dogs for physically and/or mentally disabled individuals is a much more recent concept. Dogs/puppies that are to be trained as Service Dogs can come from breeders, shelters, adoption clinics and rescue groups. What Disorders/Disabilities Can be Helped With a Service Dog? There are many disorders that a service dog can assist with. Click on About Service Dogs –> Tasks and Work, and you will find a list of some of the disorders and disabilities that service dogs can assist with. Please note that this list is by no means all inclusive and that not all dogs can be trained for the tasks. It is our intention to help people better understand the amazing impact these dogs can have on the lives of their handlers. 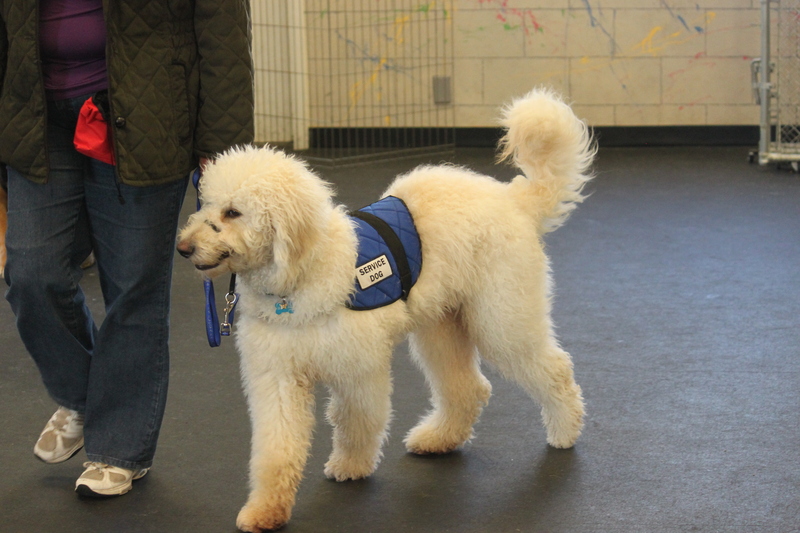 Use this list as a guide for what a service dog might be able to do for someone with a psychiatric or physical disability, but remember each individual will have specific needs.